Originally from Germany and a woodwind instrument maker by trade, Thea has travelled extensively in Scandinavia, Siberia, and northern Canada. In 2006, she conducted her MA research on discourse, knowledge, and legitimacy during the public hearings for the Mackenzie Gas Project. 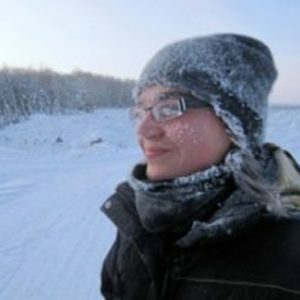 During her time at ICHR, she was pursuing her doctorate at the University of Alberta on psychological health in northern Dene communities and working in Yellowknife on evaluating the pilot semester of land-based university-accredited courses offered by the Dechinta Centre for Research and Learning.